I mentioned last week that a deal had been struck between Blackmore's, Australia's most prominent manufacturer of snake oil, and the Pharmacy Guild of Australia which would see pharmacists recommending rubbish when customers had certain prescriptions filled. This sign appeared almost immediately in shops belonging to a very large pharmacy chain. Well, it would be surprising if you thought that any such science existed. Routine use of zinc supplements is unnecessary for people taking blood pressure lowering medicines (or "antihypertensives"). There is evidence that long-term treatment with certain types of antihypertensives may reduce zinc levels, but it is unclear how often this causes zinc deficiency. Evidence for any benefit of zinc supplementation in the absence of zinc deficiency is limited.1 People taking anithypertensives should only be considered for a zinc supplement if they are deficient in zinc. Results from the only trial investigating zinc supplementation with an antihypertensive (hydrochlorothiazide) were inconclusive. Evidence does not support the use of Co-enzyme Q10 to prevent myalgia (muscle pain) during treatment with a statin. No trials have shown that taking a Co-enzyme Q10 supplement with a statin prevents myalgia. Randomised controlled trials of Co-enzyme Q10 to manage statin-associated myalgia have conflicting results and do not support routine use with statin therapy. Magnesium deficiency or ï¿½hypomagnesaemiaï¿½ has been associated with long-term use of proton pump inhibitors (PPIs). Case reports indicate that stopping the PPI is the best way to normalise magnesium levels. Taking a magnesium supplement with the PPI may not be enough to correct the magnesium deficiency. Blackmore's finally published the research supporting their four Companion Products that pharmacists were getting ready to recommend to people filling prescriptions for certain classes of drugs. Unfortunately, the research wasn't made available to just anybody as you had to be some sort of "healthcare professional". Fortunately, however, Blackmore's definition of "healthcare professional" was as loose as I suspected it might be, and I was accepted as a "Science researcher". You can read the supporting evidence here, although for some reason Blackmore's have put security on the document so you can't print it. I can understand why they might want to put Acrobat security on it so nobody can change it, but preventing printing? Smells like paranoia to me. A couple of paragraphs stood out for me. The evidence was compiled in line with the Therapeutic Goods Administration's Levels of Evidence Guidelines for listed products, and demonstrates that some prescription medicines diminish nutrients and that supplementation can improve nutritional status. Where it says "listed products" it refers to a class of medical devices or preparations which do not have to prove efficacy, just that they don't do too much damage when taken according to directions. Put another way, for something to get a "Listed" classification it does not have to be shown to work or even provide any benefit at all. Homeopathic products are "Listed". Real medicines are usually "Registered", because that classification means that evidence has been produced that they do what the promoters say they do. In addition, evidence was sourced using two key resources identified by the National Prescribing Service as having the highest quality of information for complementary medicines: The Natural Standard Professional Database and the Natural Medicines Comprehensive Database. I'm really impressed by databases of magical snake oil preparations put together by quacks, but the important message to be taken from this paragraph is that the National Prescribing Service cited has issued a statement saying that none of the Blackmore's Companion Products actually have any benefit at all. It is standard operating procedure for pseudoscientists to refer to authorities in the almost certain knowledge that the general public will be impressed by the reference and fail to see what the authority really had to say. Then suddenly the cake was flooded with icing when the Pharmacy Guild announced that the ridiculous proposal was not going ahead. You can read the official announcement here. The Pharmacy Guild of Australia and Blackmores have agreed that the Gold Cross endorsement of the Blackmores Companions range of complementary medicines will be withdrawn. The mutual decision has been taken in view of the strong level of public concern about the proposal, based on some media reporting of the endorsement which was ill-informed and inflammatory. The last thing the Guild would ever want to do is deplete the credibility of community pharmacists, or damage the trust in which they are held by Australians. That trust and confidence is of paramount importance to the Guild and to our Members. The Gold Cross endorsement arrangement with Blackmores was entered in good faith, with absolutely no intention of undermining the professionalism and integrity of participating pharmacists. There is not now and never would be any direction from the Guild for pharmacists to be involved in unprofessional, unethical or clinically unsound conduct. The idea that community pharmacists would take part in commercial "upselling" without regard to their professional standards is offensive to our profession and rejected by the Guild. However, perceptions are very important, and it is overwhelmingly clear that the public perception of this endorsement was damaging to the reputation of community pharmacy. Both the public, and sections of the broader pharmacy industry expressed strong concerns about the proposal. The Guild has listened to these concerns and accepts - mutually with Blackmores - that the best course in all the circumstances is to withdraw the endorsement arrangement. The Guild regrets any damage done to the image of community pharmacy and will do everything possible to ensure the public maintain their trust in community pharmacists as the custodians of medicines and the Pharmaceutical Benefits Scheme. The National President of the Guild, Kos Sclavos, said: "We entered this arrangement in good faith, but we have now agreed with Blackmores that the furore that has been created is doing damage, and must be dealt with before it further damages community pharmacists and the patients they serve. The only alternative is to cancel the endorsement, and this has been done. I add my personal apologies for any distress this has caused to pharmacists." Gold Cross, a fully owned subsidiary of the Guild, had agreed to endorse a range of Blackmores products, which meant that the range of four Companions products would have the Guild's Gold Cross on their packaging. Additionally, an optional prompt containing clinical information for the patient to consider in relation to one product of the Companions range was to be available through the dispensary IT programs, on a pilot basis. The software pilot was not intended to commence until at least November, and will now not proceed. 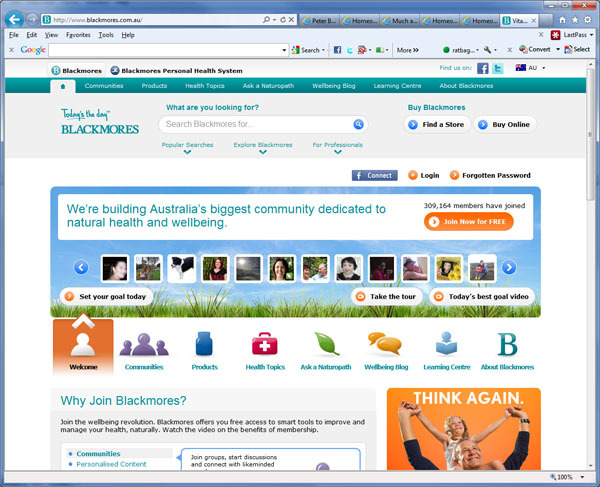 Blackmores products are well-established, and marketed by one of the best known and respected names in evidence-based complementary medicine. Many doctors, pharmacists and other health professionals make recommendations for these types of products frequently. Blackmores developed this range of four to be available exclusively through pharmacies so that consumers would always obtain the appropriate information and advice. Contrary to some media reports, there was never any compulsion whatsoever on pharmacists to sell these products, nor was there any direct incentive to any pharmacist to sell them. At all times, community pharmacists would continue to be free - and indeed expected - to exercise their professional and clinical judgement in relation to these products. They were worried about "some media reporting of the endorsement which was ill-informed and inflammatory". Perhaps they should have thought of that before they announced this stupid proposal. And I didn't see anything that was either ill-informed or inflammatory. "The last thing the Guild would ever want to do is deplete the credibility of community pharmacists, or damage the trust in which they are held by Australians. That trust and confidence is of paramount importance to the Guild and to our Members". Too late - entering into partnerships with pseudoscience can't possibly do anything except "deplete the credibility" of members of a scientific profession. "Gold Cross, a fully owned subsidiary of the Guild, had agreed to endorse a range of Blackmore's products, which meant that the range of four Companions products would have the Guild's Gold Cross on their packaging". They were joking, weren't they? What sort of professional body lends its branding and logo to anyone, much less an organisation which exists to undermine the whole basis of the profession?